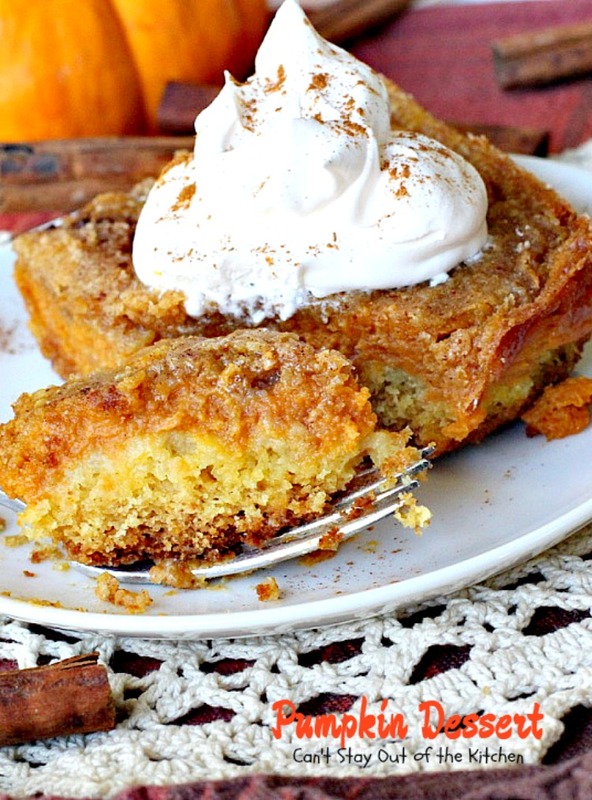 Pumpkin Delight! 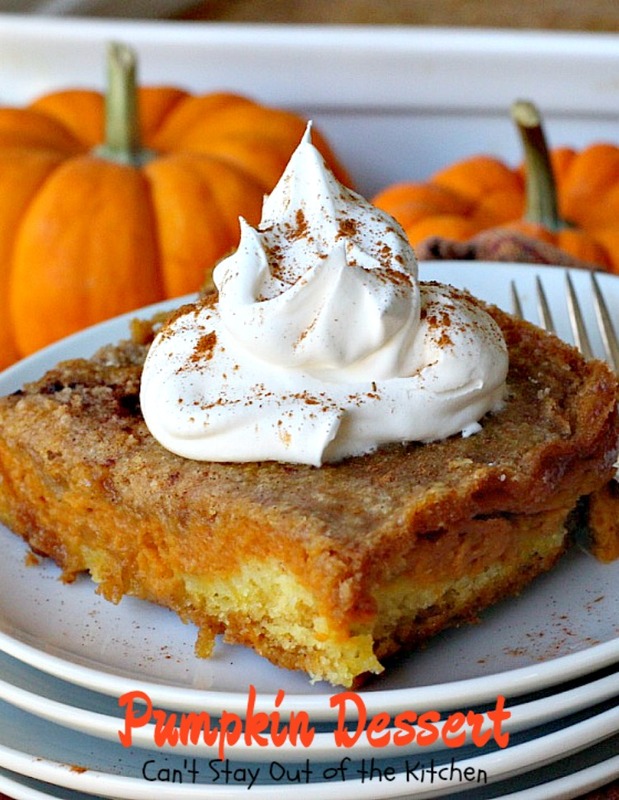 Pumpkin Dessert! Oh, my! This is a fabulous dessert and great for holiday entertaining. This is one of those scrumptious recipe finds that your family will love. It’s a great recipe to use to replace the traditional pumpkin pie during the holidays (that’s not being sacrilegious is it?) And it’s a whole lot easier than making home-made pie crust. 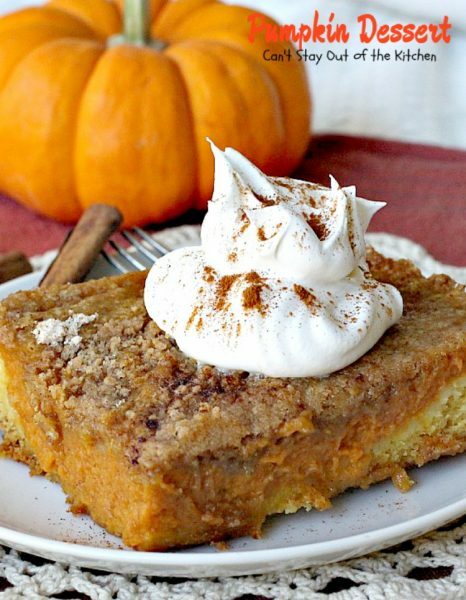 Pumpkin Dessert is a layered pumpkin dessert with a box cake mix crust, pumpkin pie filling in the center, streusel topping and then whipped cream spread over top (or dolloped on top of individual servings if you prefer). For those of you who don’t care for cool whip you can substitute scoops of ice cream on top. You can even add nuts if you prefer, although this recipe doesn’t call for it. My favorite cook, Mimi Pownall, provided me with the recipe. 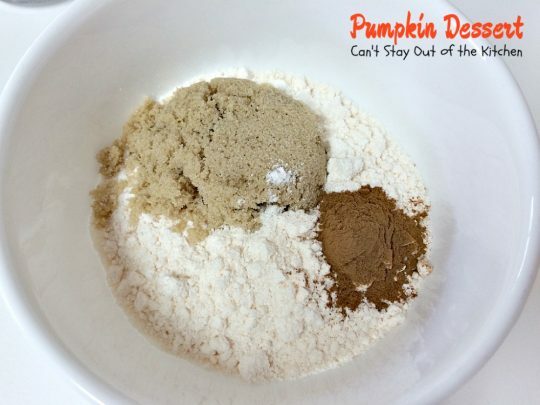 I’ve looked all over the Internet and cannot figure out how originated the recipe, but I wouldn’t be surprised if it wasn’t originally from Libby’s Pumpkin Pie Mix. There are hundreds of delicious recipes on this site and they include Nestle’s Toll House recipes and Carnation recipes so they have a great selection. Here’s another place to stop on their website and drool over fantastic looking recipes. The recipe Mimi gave me offers two ways to make the pumpkin filling. One with Libby’s pumpkin pie mix (you can only find this during the holidays so you have to stock up if you want it throughout the year). 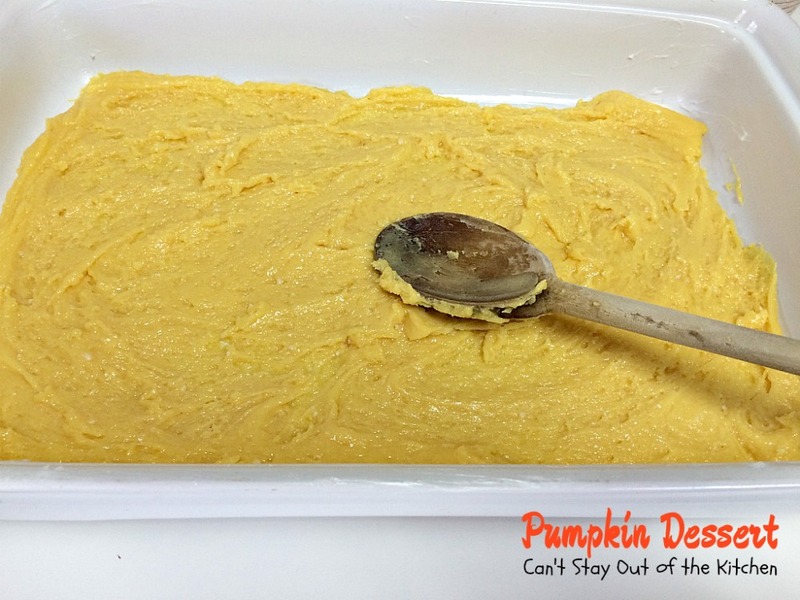 The other way is to use canned pumpkin and extra ingredients to make it into pumpkin pie mix. Whichever way you make it, Pumpkin Dessert is sure to please every appetite. It is rich, gooey, delicious and to die for! Go ahead and be brave. 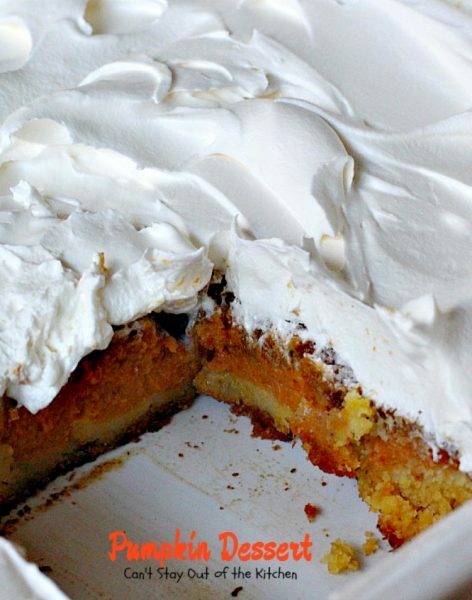 Skip Pumpkin Pie this year and make Pumpkin Dessert instead. It will surely satisfy every sweet tooth craving. When I initially posted this recipe in July 2012 it was only a few weeks after I began blogging. I was using an iPhone 3 for a camera so my pictures were blurry and not very presentable. For a dessert as magnificent as this one, I knew that had to change! 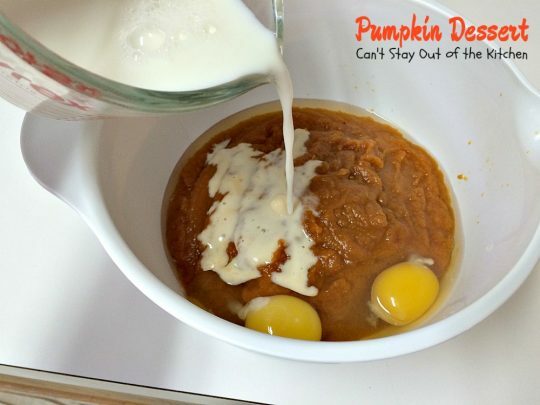 A couple of thoughts about making this dessert: if you don’t find pumpkin pie mix and have to mix up your own per the recipe below, don’t forget you still have to add the additional milk and eggs to it that are in the pumpkin layer. Also, while I cut the butter into the streusel topping and added it on top before baking, I’ve also melted the butter for the streusel as well. That makes a different consistency and you just kind of glob the streusel topping on top, but over all the taste is still great. Either way works out wonderful. Finally, you do have to make sure you cook this recipe long enough so that it sets up correctly. I’ve NEVER been able to get it to cook in under an hour whether my oven was hot or slow. I actually took this out of the oven (after 45 minutes), and allowed it to cool completely. When I cut into it, I realized it really wasn’t done enough. I put it back into the oven and cooked it another 15-20 minutes before I was satisfied that it was set completely. The second time was a charm, because this time it was completely baked. This is supposed to be kind of like a custard, so it does need to be cooked all the way through and not be gooey in the center. I hope you enjoy this recipe. It’s always been one of our holiday favorites. This delicious recipe is posted at All Free Casserole Recipes here. Pumpkin Dessert is one of our favorite Thanksgiving desserts! Here, I’ve dolloped the cool whip on top of the Pumpkin Dessert. Serve this luscious dessert either way: with cool whip dolloped on top or spread over the entire dessert. You can also serve Pumpkin Dessert with ice cream if you prefer. Measure out 1 cup of the yellow cake mix and reserve it for the streusel topping. Place the remaining cake mix in mixing bowl, add egg and butter. Stir all ingredients together. Dough will be very sticky. Spray baking dish with cooking spray. Press cake mix dough into sprayed baking dish. In another mixing bowl pour pumpkin pie mix. Add eggs and milk. 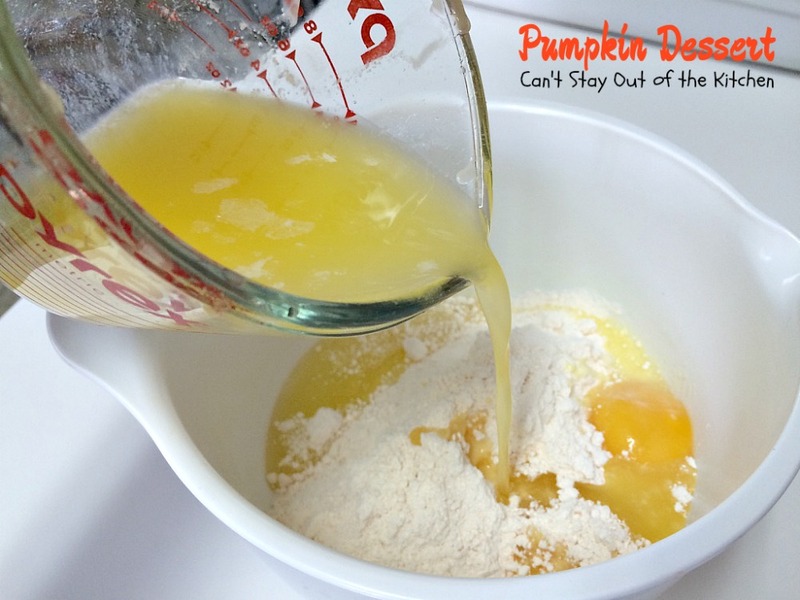 Stir pumpkin pie mix ingredients together with whisk. 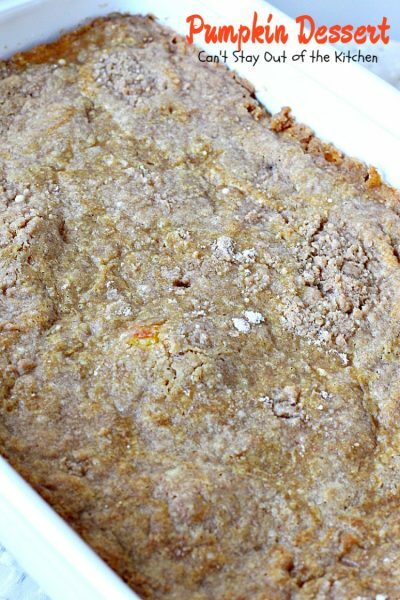 Pour pumpkin mixture over top of crust mixture in baking pan. To make streusel: Place reserved 1 cup yellow cake mix in mixing bowl. Add brown sugar and cinnamon. Stir streusel ingredients together. Cut in cold butter with a pastry blender until well combined. Sprinkle streusel mixture on top of pumpkin mixture. Bake about 60-70 minutes at 350. Mixture will be firmly set in the middle. 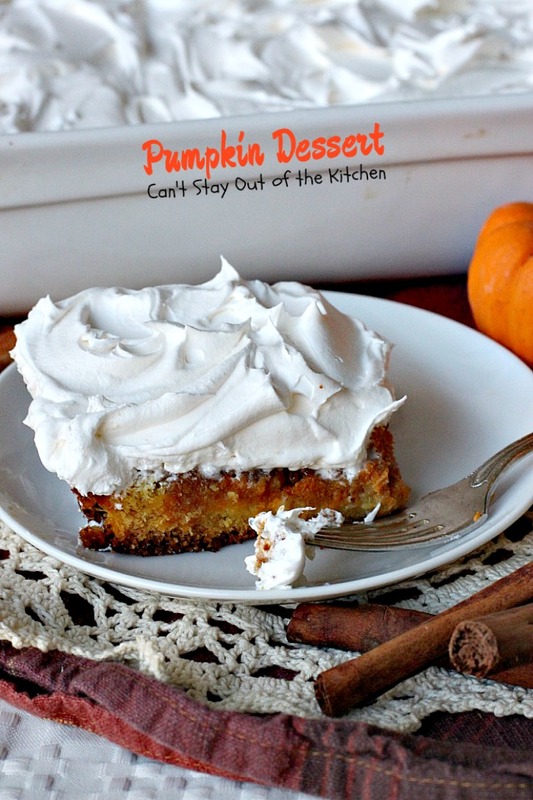 Pumpkin Dessert is one of the best desserts you’ll ever sink your teeth into! Here it is without Cool Whip topping. The nice thing about this dessert is you can freeze it either before or after adding whipped topping. I normally serve the dessert by spreading the topping over top of the whole dessert. This spectacular dessert is better than eating Pumpkin Pie and so much easier than rolling out homemade pie crust. It's fabulous to make for holiday entertaining. Mix above ingredients and spoon into prepared pan. Because this mixture is so sticky, you will need to spread it into the pan with the back of a wooden spoon. Mix together and pour over crust layer. Stir cake mix, brown sugar and cinnamon together. Cut in butter with pastry blender (or you can melt the butter in a microwave and just stir everything together). Bake at 350° for about 60-70 minutes or until set. Top with Cool Whip when cooled and refrigerate. Or you can freeze this (with or without cool whip on top). Remove from freezer an hour before serving. Mix ingredients and use in place of pumpkin pie mix. NOTE: I like to refrigerate this dessert spread with Cool Whip topping overnight before serving as it enhances the flavors. NOTE: The topping and filling needs to be completely set before this recipe is done. If the top starts browning too quickly, tent with foil until dessert is baked thoroughly. NOTE: Your oven may cook more quickly. Start checking after 45 minutes. NOTE: I have also softened the butter to make the streusel topping but it will have a different consistency. NOTE: This recipe for Homemade Pumpkin Pie Mix replaces the pumpkin pie mix in the recipe. You will still need to add the two eggs and 2/3 cup milk to complete this layer. This spectacular des[url href=”http://cantstayoutofthekitchen.com/2012/12/05/homemade-pie-crust/” target=”_blank” title=”homemade pie crust”]sert is better than eating Pumpkin Pie and so much easier than rolling out [/url]homemade pie crust. It’s fabulous to make for holiday entertaining. Remove from freezer a few hours before serving. I like to refrigerate this dessert spread with Cool Whip topping overnight before serving as it enhances the flavors. [br][br]The topping and filling needs to be completely set before this recipe is done. If the top starts browning too quickly, tent with foil until dessert is baked thoroughly. [br][br]Your oven may cook more quickly. Start checking after 45 minutes. 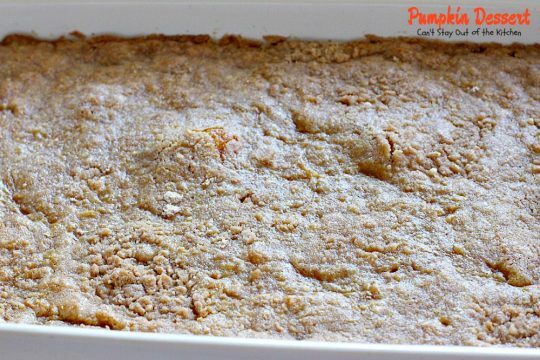 [br][br]I have also softened the butter to make the streusel topping but it will have a different consistency. 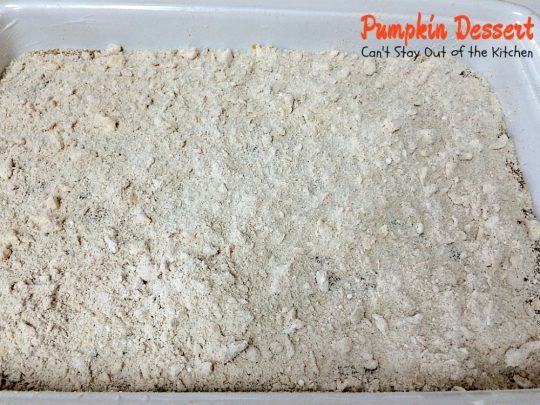 This spectacular dessert is better than eating Pumpkin Pie and so much easier than rolling out [url href=”http://cantstayoutofthekitchen.com/2012/12/05/homemade-pie-crust/” target=”_blank” title=”homemade pie crust”]homemade pie crust[/url]. It’s fabulous to make for holiday entertaining. 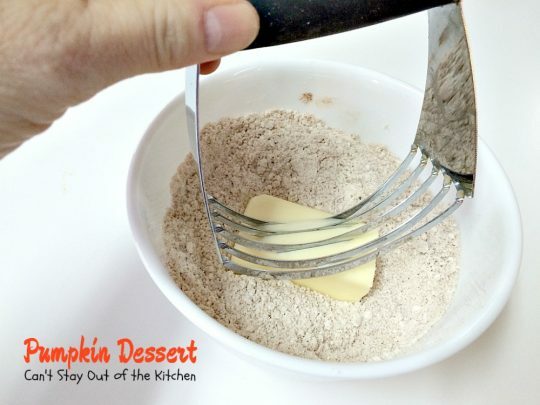 This is a simple way to make your own Pumpkin Pie Mix in recipes. This recipe replaces the pumpkin pie mix in the recipe. You will still need to add the two eggs and 2/3 cup milk to complete this layer. 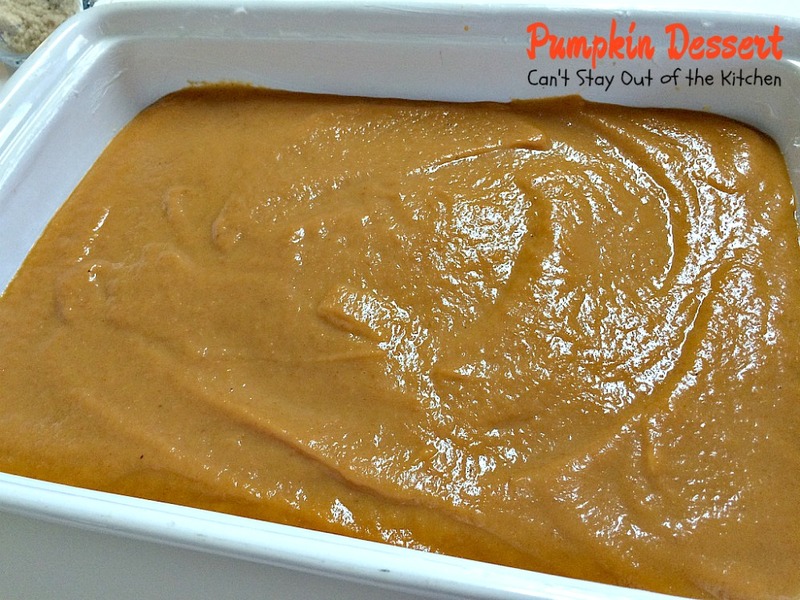 Pumpkin Dessert is so much easier to make than baking home made pumpkin pie with a homemade pie crust. 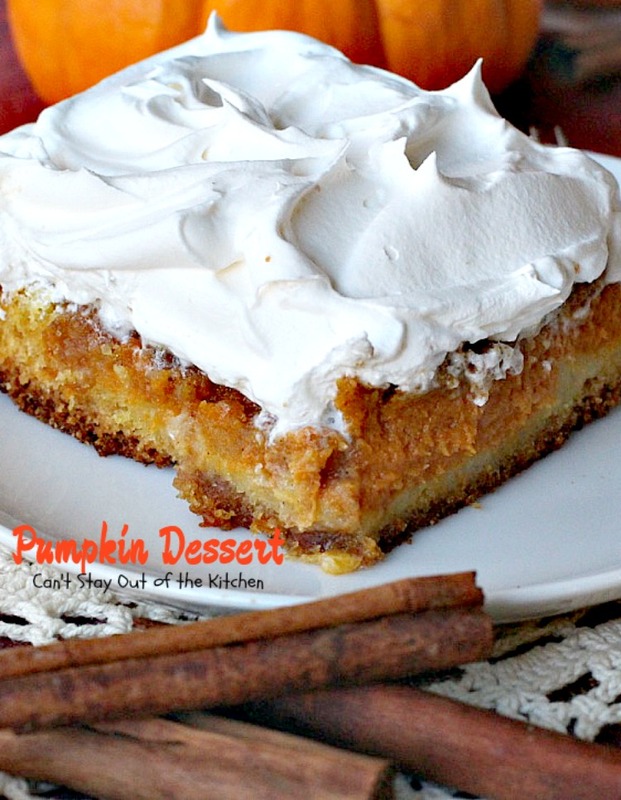 Pumpkin Dessert is a spectacular dessert for holiday entertaining. Everyone loves this dessert. Your guests will love this holiday dessert! Just wondering what size can of pumpkin or pumkin pie mix. 30 oz or 15. Thanks! Mary, I use a 15-oz. 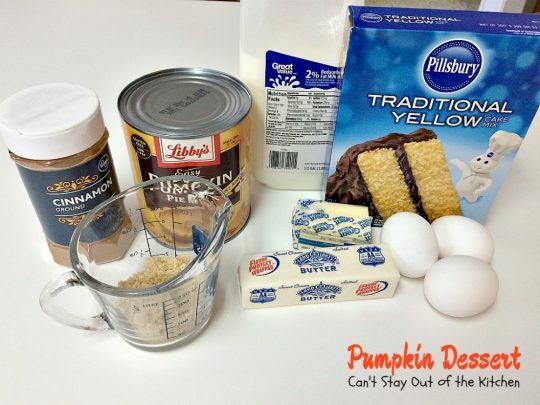 can of pumpkin when I make this and add all the other ingredients necessary to make it pumpkin pie mix, or a 30-oz. can of ready made pumpkin pie mix. 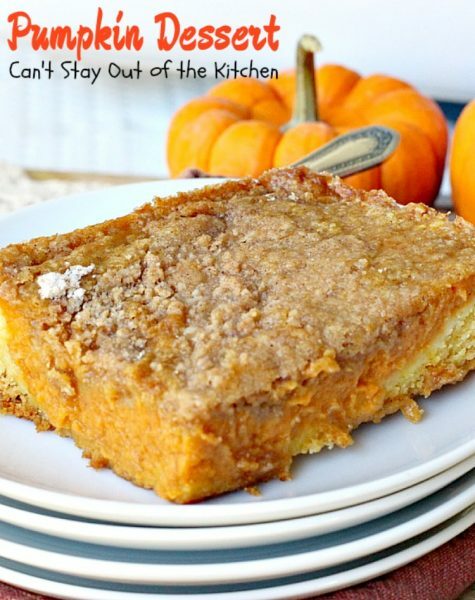 I tried this and the last step came out terrible me and my husband followed the last steps one by one and it still turned out thick and not able to “sprinkle” i’m really frustrated considering I was making this for thanksgiving for both my husbands offices. I wasted money and a lot of time on this to turn out the way it did. You should fix your instructions or something because no way it turned out like that. I wasted my entire night. Amanda, I am so, so sorry. I’ve never had any problem with dabbing the streusel topping on top. It bakes into the pumpkin dessert and will not be a crispy, crunchy sprinkle (as my pictures show), but it adds a lot of flavor. Then I cover the dessert with Cool Whip so you are never able to actually see the streusel. I bet if you cover the dessert with cool whip and refrigerate them until you’re ready to serve them everyone will find them fantastic. Again, I apologize. I’ve never had the dessert turn out tasting badly or having a weird consistency.